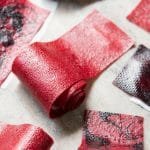 All-natural and pure fruit goodness, these homemade paleo and keto fruit roll-ups are just 1 ingredient, super easy, and require no fancy equipment! Pure Fruit ‘N Only Fruit! 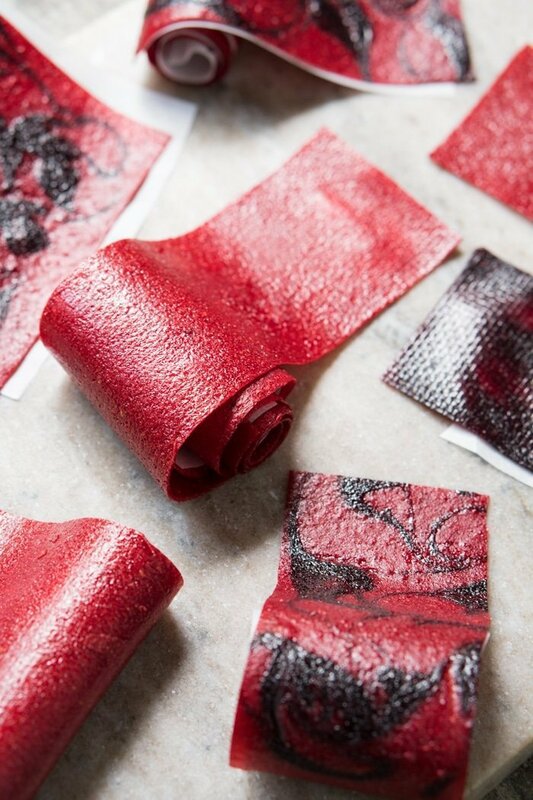 That’s right, these sugar free fruit roll-ups are made with just fruit. 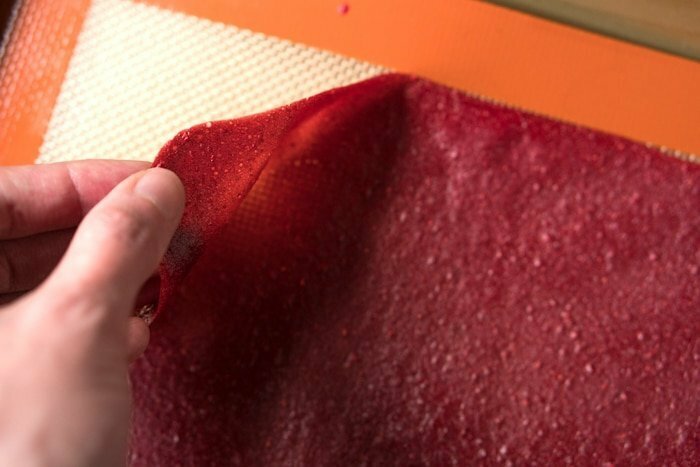 Particularly now that summer is in full swing, and berries are at their prime, you’ll likely find that this sugar-free fruit leather needs little help (if at all!). And these, in all honesty are just amazing. Way (way!) better than I expected before I tried them out. As in, they actually come out like proper candy. Sticky, chewy and intensely fruity goodness. You can definitely use a dehydrator if you’ve got one, but you can whip these guys up in your oven too by setting it to its lowest temperature (what I did!). So you puree your fruit of choice (berries if keto, you can throw in mango if paleo too), sieve out any seeds, spread on a baking tray, and bake at a super low temp for a few hours. 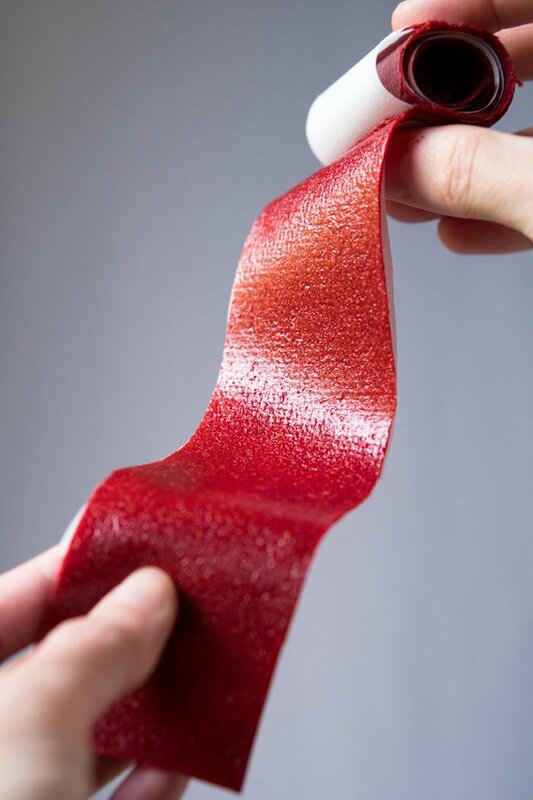 And ta-da pure fruit roll-ups emerge! 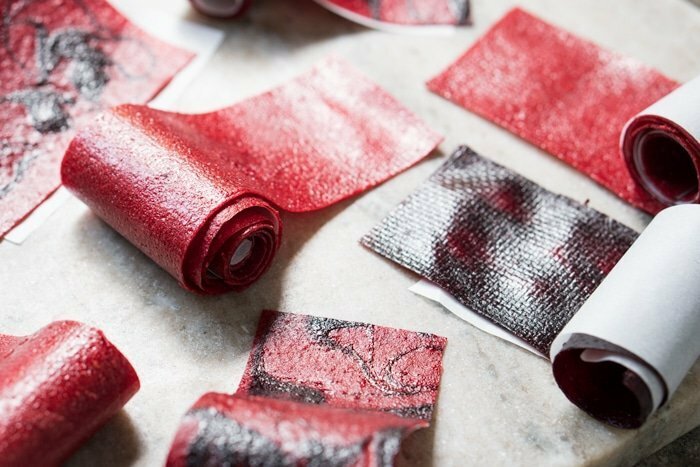 If you’re using prime summer berries (and been keto for some time), you’ll likely find that these keto fruit roll-ups need no extra sweetener. Particularly if going for pure strawberries, blackberries or blueberries. But if your fruit is a little tart, or you’re doing raspberries, you can always add a tablespoon or two of sweetener. You can even use stevia drops and pure monk fruit here too! Ideal. But overall, you can pretty much use whatever sweetener floats your boat. As even though you’ll get slightly different tasting results with each sweetener, they’re really not too fussy. Think erythritol (Lakanto or Swerve), xylitol and Pyure (at half the amount). And if paleo (or not restricted by sugar), coconut sugar, maple syrup or honey work great. Pure your berries of choice in a high speed blender until super smooth (I love doing 2 parts strawberries 1 part raspberries!). Sieve out the seeds from your fruit puree. Spread 1 cup of smooth berry pure per baking tray (half sheet size) as evenly as you can, without leaving translucent streaks. I prefer to use a baking mat for smoother results, but lining the tray with parchment paper works great too. And you can always mix different berry flavors in the same tray! Dehydrate in your oven at the lowest possible temperature (140-170°F/60-75°C) for 3-4 hours until the center is just no longer sticky to touch. 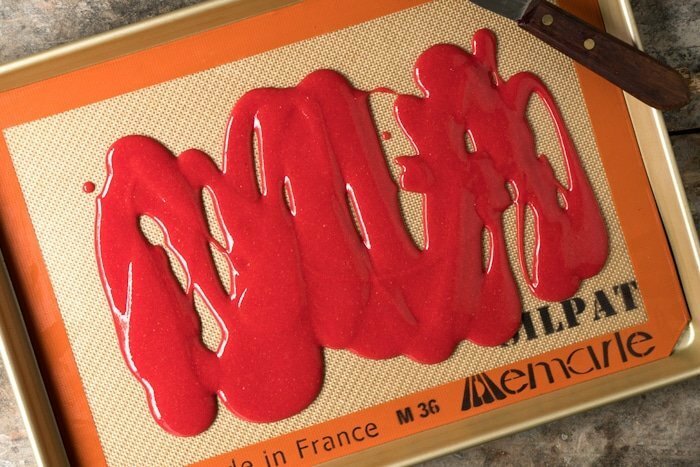 If your oven is old school, you can always leave the door slightly ajar. As a good rule, check in every 30 minutes the first time you whip them up. And you can always dehydrate 2-3 trays at the same time. 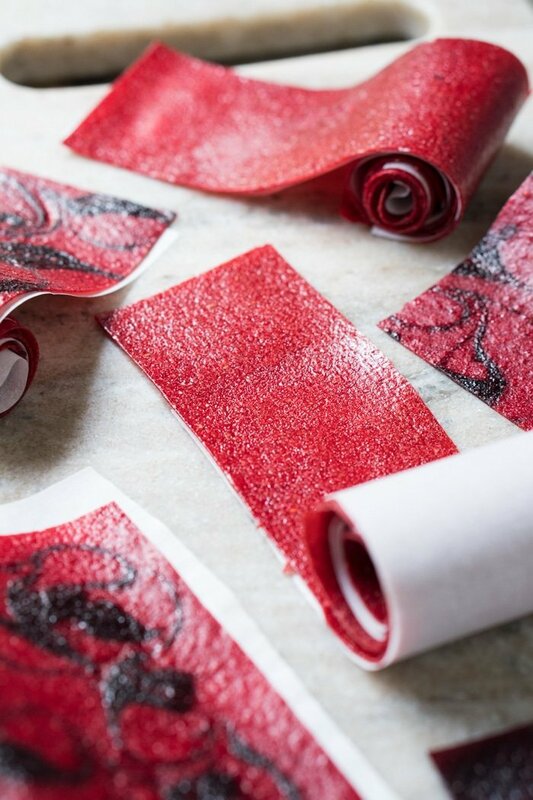 Peel off the fruit leather gently off the baking mat and cut in desired shape. 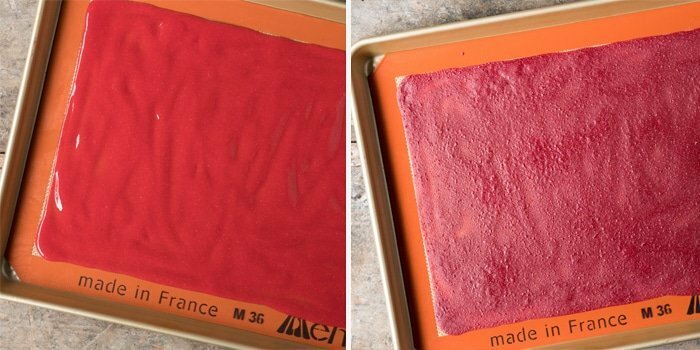 It's possible that the texture feels a little dry, but keep in mind that it will become sticky overnight, so you'll want to roll up the pieces using parchment or wax paper to keep it from sticking. And if you baked on parchment, just cut up the strips along with the paper. The edges can be a little dry, so just trim them off and enjoy as 'fruit chips!'. Store in an airtight container in a cool place (or the fridge) for about a week, and in the freezer for a few months. 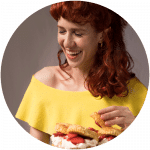 And keep in mind that nutrition facts here can vary widely depending on the berries used. Our values were estimated using my favorite combo noted above and assuming a yield of 8. Hi!! As I type these are in the oven!! 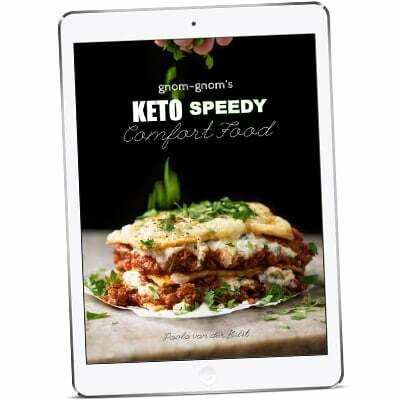 I’m knew to keto and still trying to figure out how to tell what the net carbs,fat and protein are! Any tips?! How many stevia drops or pure monk fruit would I need? Hi Andrea! I think that really depends on the tartness of your fruit, so I suggest adding it little by little to the puree mixture until you like the taste xo! About to make these and I just realized my new oven won’t go below 200 degrees F. I have a proof setting that is only 100 degrees F. What should I do?? I have never tried to do 150 degrees! Should I set at 200 and leave it open a little bit? Don’t worry, my oven doesn’t go that low either (it’s super old and basic!). Just leave the door slightly ajar and check in on them every so often. I put in the oven for nearly 4 hours. Middle wasn’t sticky but when I went to pull it off the mat underneath was still wet and it all fell to bits in my hand… any idea why? What did I do wrong it’s such an easy recipe..
I’m a lazy gourmet. Is it necessary for the outcome to sieve the seeds out? I made these with 3 ingredients: strawberries, xylitol, and laziness. If you have a high-power blender (I used a Vitamix) the seeds will disappear anyway. Great recipe Paola! I baked for 3.25hrs on 170. I didn’t even get crispy edges, just yummy gumminess. Tried this today with fresh mulberries–soooo so so amazing!! Really satisfies a gummy candy craving. Every single one of your recipes is fantastic, like OVER THE TOP fantastic. You are a true recipe wizard!! Oh these would be amazing with mulberries (def jealous we can’t find them in a Mexico!). And SO happy to hear you’re enjoying the recipes Artie! Xo! Omg 😂!! Literally cracked up Brandi! I’m just sorry you didn’t get to try one 🙈 Tomorrow lol! 😂😂😂 well that certainly speaks to recipe success! Does it make a difference if you use fresh or frozen berries?